This cute idea came from Do Stamping, and I thought it was a perfect "almost fall" project for stamp club. The sucker part of the Dum Dum is down in the flower pot and then all we had to do was add a flower to the stick. We also used the new In Color Dahlias for the center and an extra little something. This month's scrapbook layout was inspired by a layout I saw on Pinterest (scrapbooking.about.com). It was a nice way to display a lot of picture, yet it will allow my scrapbook ladies some flexibility to crop their pictures their own way. I try to create layouts for scrapbook club that hold a number of pictures, and on this one, there is a small white box for journaling or even another picture. For the buttons, I cut a thin piece of coordinating card stock to be the thread in the center of the buttons. Here's another great project designed by Julie Davison for our Spring into Stamping several months ago. I didn't change a thing but the words from her original design. It was just such a clever fold, I knew we had to do it in stamp club. Here's another Christmas card that I made for a swap I was in with a group of fellow demonstrators. I liked it so much that I decided to use it with my stamp-a-stack groups too. There's a little coloring and embossing and then a little Dazzling Details on the snowballs. Here's a quick Betsy's Blossoms card I made as I was trying to create a swap. You can see the card I ending up making here. As you can see, I went an entirely different direction, but that's the beauty of stamping - a change in colors and/or layout make an entirely different card with the same stamp set. Here's a card with coloring that's even ok with the people who don't like to color. There's not a lot to color and with a blender pen, it is more forgiving. We also used an Apothecary Accents Framelit and the Striped Embossing Folder. You have to look closely to see that we embossed the the bottom 2/3 and left the top plain. It makes an impact in real life. The two stamp sets were my new hostess sets - Summer Afternoon and Wacky Wishes. This is my version of a basket we made several months ago at Spring into Stamping. It uses the purse die which makes that die much more versatile. Julie Davison designed her basket (seen here) based on one made by Betty Traciak. I wanted to use my new Floral District Designer Series Paper so I switched up the colors and used the butterfly from the Four Seasons hostess set. The Happy Hour stamp set lends itself to bright and cheerful colors. I picked three colors and started stamping the cheers word down a strip of paper and had this card made in no time. I look forward to using it at Christmastime too because there's a spring of holly and the words - "Wishing you Christmas Cheer and a Happy New Year!". It's never too early to start Christmas cards - this was one of our Christmas in July cards. ﻿This stamp set, Chock-Full of Cheer, is in the big catalog with a coordinating wheel and Designer Series Paper. The Mitten Builder Punch makes quick work of cutting out the mittens, but in July we had to cut by hand which wasn't too bad either. I took my color choices for this card from the coordinating Orchard Harvest Designer Series Paper and stamped the apples in Raspberry Ripple. Who knew? Raspberry apples. But it looks great and fallish. This paper pack has a lot of great choices so it was easy to put a card together around this paper. I'm looking forward to using the Cannery Set Framelits with this stamp set too! I have always found black and white cards to be dramatic, but when asked if I could make this into a baby card, I made one in blue, yellow and pink too. With the Elegant Butterfly punch that coordinates with the new Papillon Potpourri butterfly set and the new Fancy Fan embossing folder, this card went together quickly. The white craft ink takes a couple minutes to dry so stamp first, then make the butterflies and then you are ready to run it through the Big Shot. I love all of the framelits that coordinate with so many of the stamp sets in the new Holiday Catalog. The Holiday Ornaments Framelits and the Ornament Keepsakes stamp set are available in a bundle which will save you 15%. And really, who could buy one without the other? My friend, Rae Anne, sent me this type of birthday card several years. I've kept it out on my shelf since then and I decided it was time to try my hand at one of my own. I am calling it an accordian card, but I don't know what the "offical" name is. With the graduated sizes, you do have to plan your stamps for the 3 panels just a little bit before starting. A stamp set with varied stamp sizes works best. I used Patterned Party with a greeting from Bring on the Cake. It was a big hit at stamp club, so thanks Rae Anne for the great idea. The great thing about paper crafting is that it is so versatile. I made these cards full sized, they can be tweaked a little and become 4 x 4 cards. Here are the full sized versions. Card 1, card 2 and card 3. 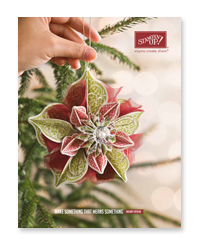 The new Holiday Catalog is here, and if you haven't seen it yet, it is fantastic! If you don't have a demonstrator and would like a copy, please contact me (top right of page), and I will get one to you right away. The first thing you will notice when you have your own copy, is that it is big. So bigger pages can only mean more great products. Click here to view online and see for yourself. Shop this catalog August 1 - January 2.